Can You Make It Through This Post Without Your Brain Melting? 1. OK. Let's get your brain warmed up with some 'impossible objects'. This classic optical illusion is known as a Blivet. Just so you know. 3. This one's a 'motion illusion'. Feel dizzy yet? 5. White lines, or grey spots? Another classic, this is called the Hermann Grid Illusion and has been confusing people since the 1870s. 6. Now. Consider that the horizontal lines in this picture are perfectly straight. This illusion was discovered by Dr Richard Geoaring as he stared at the tiles in his local cafe in Bristol, possibly while hung over. 7. That this isn't a spiral. 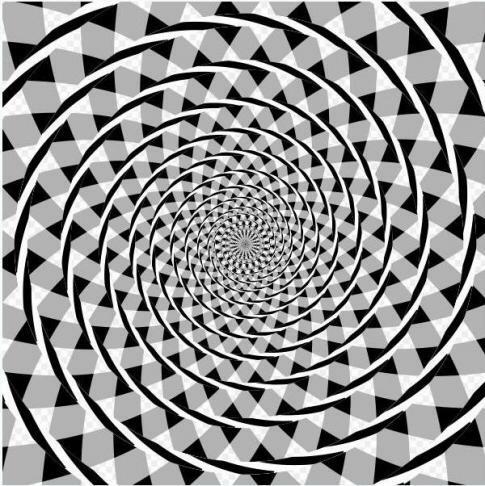 It's just a series of concentric circles, know as a Fraser Spiral Illusion, first glimpsed in 1908. 8. And that the orange circles here are exactly the same size. Don't believe it? Try measuring them. They call this the Ebbinghaus Illusion. 9. And if that wasn't messed up enough, so are these two shapes. You can thank American psychologist Joseph Jastrow for inventing this in 1889. 10. But enough of the old stuff. Let's step it up a level. Count how many people there are in the drawing, then wait for it to split in half and count again. Confused? 11. Now, stare at the dot at the centre of this black and white image. Wait for the countdown to end, and you'll think the castle is in colour. It isn't. 12. Now. Can you find the hidden giraffe in this picture? 13. Feel OK? So which direction is she looking in then, left or right? 14. Now, consider this: the blue and green stripes in this picture are actually THE SAME FRICKIN' COLOUR. Don't believe it? Check in Photoshop - colour code RGB 0-255-150. Admit it, your brain is feeling a little hot right now. 16. Now try and figure this out. 17. OK it's time to turn up the heat. Is this guy looking sideways, or straight ahead? 18. Still got it together? Good. Now stare at the cross in the centre of this for a while. Suddenly, your eyes aren't the only ones doing weird things. 19. This is just a cat we like. Take a breather and enjoy it. 20. Now it's time to see Jesus. Stare at the four black dots for 30 seconds, then close your eyes and look at something bright. (A lamp or a window will do). 21. This is a tricky one. Inside this sunset is a very famous movie star. ...and the pinks dot vanish! 23. Is she spinning clockwise? You sure? Look for a couple of minutes and she'll change direction. Freaky. 24. Now wait until you've zoomed in on the centre of this image. 25. Finally, follow the instructions in this video. Look around you. Congratulations. Your mind is officially blown.